Jenn is the mother of one of Jessalyn's best friends. Jenn and her entire family are dear to us. Please consider donating to this cause. I do have a limited amount of tickets. If you'd like me to put your name on one (or more) please let me know. The bracelets are being sold for $5. I have a handful of those as well. Let me know if you'd like one. Jen and Chris live in Meredith with their 12 year old son and 11 year old daughter. Jen is a native of Meredith and Chris has lived in the Lakes Region since he was 3 years old. Chris has worked at American Eyecare in the Belknap mall for the past five years. Until Jen was diagnosed with extremely aggressive Multiple Sclerosis in March 2010, she worked at the memory support unit at Meredith Bay Colony Club in addition to a private care giver for area residents. At the time she was diagnosed Jen lost the ability to drive, work and many other things a 38 year old wife and mother usually do. Jen has deteriorated at an astounding pace with no end in sight. They have tried several very aggressive treatments, yet Jen continues to show rapid progression. Jen spent most of the summer in LRGH and Health South Rehabilitation Hospital in Concord, with occasional stays at Concord Hospital. While in Concord she developed a blood clot in her leg that required bed rest for several weeks. She has continued to weaken since then. At Various times she can’t move her arms or legs, open her eyes or speak. Fatigue really affects her condition so even the easiest of tasks, like getting out of the car or showering, cause her issues. Jen goes to the Doctor often and has many therapies outside of the home in an effort to regain her strength. She was able to borrow a scooter from the wife of a former patient and her church helped purchase a used handicap accessible van. The van worked great and Chris put $3000.00 into the van so it would last for some time. As Jen’s condition worsened she needed a custom power chair that offered her more comfort and mobility. In August 2011 she received her new chair which was a blessing, unfortunately the new chair is taller and heavier and does not work with the van they have. The chair lift is not substantial enough to safely lift Jen in the chair and the roof is not tall enough so Jen must tilt the chair back and ride with her face 5 inches from the ceiling. This has made their current van useless for comfortable, reasonable transportation. Jen’s mom, Sharyn Childs, has left her position at the Laconia Clinic after 30 years to be Jen’s caregiver when Chris is at work. Jen’s father Irv was a local police officer for more than 20 years and now works part time for 911. Chris’ father passed away in April 2011 and his mother has been disabled since 1985. Jen thankfully receives Social Security Disability but it is only a portion of what she made when she was working. A 1999 Ford handicap accessible van has been offered to Jen and Chris for $8500.00. This van has a stronger lift, custom raised roof and many other features which would be perfect for Jen. This is a great opportunity for them and would allow Jen a fraction of the independence and normalcy she has lost. She is also in need of various modifications around her home. A kitchen that she could use while in her chair, a bathroom she could use independently and a bedroom she can have privacy and easy access too. These would allow her to do some of the daily tasks we take for granted. Please consider a monetary, tax deductible donation for Jen, any amount would be appreciated. 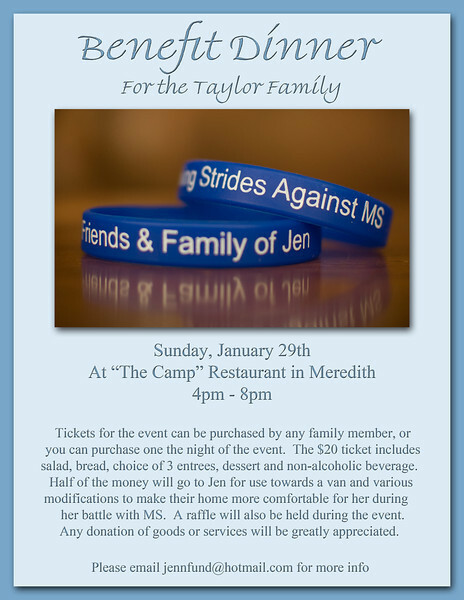 We will also be holding a fund raiser dinner at Camp restaurant in Meredith from 4-8 pm on January 29th. Tickets for the event can be purchased from any family member or just show up the night of the event. The $20 pp ticket price, half will go to Jen, includes salad, bread, choice of 3 entrées, dessert and non-alcoholic beverage. A raffle will also be held that night, so any product or gift certificate donations are greatly appreciated. Who's bright idea was it?